Isn't it exciting??? Well, it's exciting to me!! Last year I was able to attend the first ever Creative Connection Event and it was such a wonderful experience. 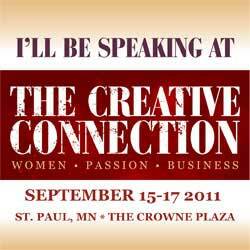 This year, I will be there speaking, as one of the panelists. I haven't done public speaking since High School so this should be really scarey fun!!!! The icing on the cake is the special event that will be happening in the Marketplace. We will be doing a slideshow of many of the fabulous studios that will be showcased in this years Where Blogger's Create event, and I think they have a few other surprises up their sleeves! And speaking of this years party..... ssshhhhh. I'll be making the announcement VERY SOON! I so wish I could make it to the event this year. You were hands down the absolutely nicest person I met there last year! How exciting for you, Karen! I'm so happy for you! I wish I could go! You will do great, I know. You will do great! There is no way a woman with the energy and creativity you have could do any less! Wish I could be there! Sounds exciting. I am sure you will do great! Congratulations, Karen! I'm sure it will be fun! It IS exciting! Congratulations on being a speaker at TCC! This event looks so amazing and I'm determined to attend, if not this year, then next. Have a wonderful time! Congratulations girlfriend! I know you'll do an amazing job. Best of luck, and I hope we can get together soon. congrats!!! you will do a perfect job!!!! Congratulations Karen. This is very exciting for you and I only wish that I could attend so that I could meet you in person. Thanks again for my amazing blog, you are the best! How awesome is that???? I love your bio too! You are a who wears many hats, yet has time to be creative!! Excellent! I know you will be great!! Can't wait to hear about your Where Bloggers Create party! I thought it would be in June, I'm glad I have a bit more time!!! Can't wait to see your announcement!! Karen, What a great opportunity for you! I cannot imagine you not speaking wonderfully in front of a crowd. You're beautiful and you have done so well with your blog designs and ebook. You have much to offer, the least of which is your sweet personality! I hope you have a blast! Awesome...you go girl! I know you will be great!!! I wish I could go. I would love to meet you. You are going to be awsome. Good for you & so happy for you! Let's get together soon! Congratulations Karen! How exciting for you! Heck, I'm excited for you! I wish I could be there, then I could meet you,girl genius. Have fun! Congrats as you will be such a great speaker...have fun as you will do Great!! Congratulations Karen - you'll do so great! It will be a wonderful and exciting time and is very well deserved! 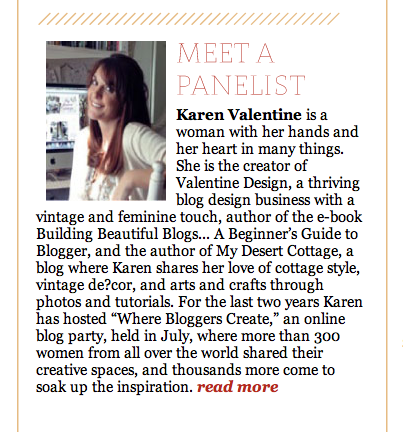 That is super Karen, wish I could be there, it sounds so inspiring. We are going to MN this summer, so won't be able to go up again! I sure wish you the best with that whole thing!